This article will show you how you can bind and display the dropdown list value in group form in asp.net mvc application using C#.net and how you can retrieve selected value of the dropdown list in asp.net. Some of my previous articles are as follows: C# Conversion of DateTime to 24 Hours Time in Asp.Net | Display 24 Hour Time In DropDownList In Asp.net, jQuery DatePicker Calendar With Dropdown Month and Year in Asp.Net, Load Partial View By Selecting Value in Dropdown Using C# in Asp.net MVC, Bind DropDownList Using Entity Framework in ASP.Net MVC Using C#, DropDownList Bind By Using XmlDataSource in Asp.Net. So for this article first we will create a new asp.net mvc application in this we first we will create a new model class. Now we will create controller. In this we will add the add the get and post method code. In above code I have created the list of parent and child item of the dropdown list item. In post method I have retrieved the selected value of the dropdown. 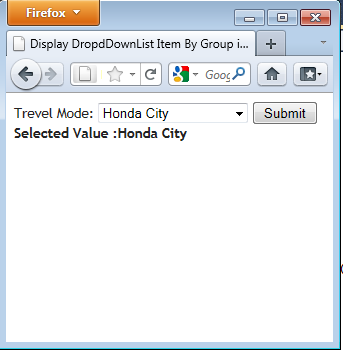 In this we are getting the id of the selected item in dropdown. Now we will create view for the controller action result. In above code in on the bases of the selected value and the child item value getting selected state. Now run the page for the output. Select the item and click on submit button. 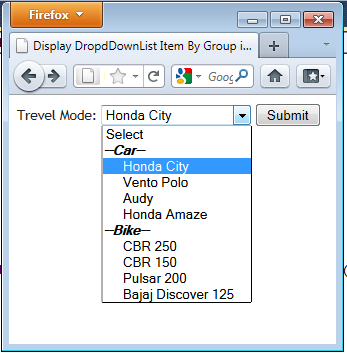 In this you will not able to select car and bike which are parent in dropdown.